Established in 1993, Australian Automotive Intelligence is a specialised business and policy consultancy focusing on the Australian automotive industry. AAI publishes the AAI REPORT and AAI YEARBOOK, assists industry organisations and companies in their submissions to governments and consults with companies on strategic, market and other automotive industry matters. Led by economist and industry specialist Richard Johns, AAI has developed an enviable reputation for providing comprehensive and independent analysis on a broad range of issues concerning Australia’s automotive sector. The expanded and fully updated 13th edition of this unique publication is now available. 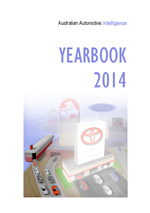 AAI’s 2014 YEARBOOK continues to build on the success of previous editions and delivers the most comprehensive information source available on the Australian automotive industry. With its unique data and independent analysis, the AAI YEARBOOK provides a rich and valuable insight into Australia’s automotive market and industry making it a ‘must have’ tool for anyone who needs to stay well informed. 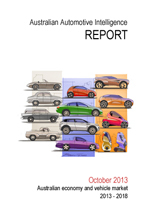 The AAI REPORT is published six times a year and provides benchmark 5 year forecasts of the Australian vehicle market and economy, independent analysis of market trends and strategic research on the industry. Since 1993, THE REPORT has developed into a respected resource for subscriber companies, offering high quality and professional inputs to the senior executive, the professional specialist and the analyst. THE REPORT is available by subscription. Find out more about THE REPORT and how to subscribe. Australian Automotive Intelligence offers expert consulting services, specialising in automotive industry policy, markets and strategy. In this section, we provide a brief outline of the Australian automotive industry and market. This section is updated regularly with current data and analysis.